When the picture-perfect Jenson's move into her quiet neighbourhood, Freya Kiley is bothered. There's something strange about them, they seem impeccable, a world away from her large and quarrelsome family. Somehow these new neighbours effortlessly start to take up so much space in their lives. The local boys: Avery and Garrick; and Freya's brothers Syd and Declan, take this change to their world with delight. The Jenson boys, Colt and Bastian, are showered with gifts from their father Rex and their arrival has brought with it a splendid bike and playroom full of skateboards, slot cars, miniature trains, and the promise of a swimming pool by summer. The Jensons are like a family from a magazine, and Rex the hero – successful, attentive, attractive, always there to lend a hand. But Colt finds his father's presence impossible. He's unbearable and suffocating, spending money not merely to make his sons envied, but to make them enticing. 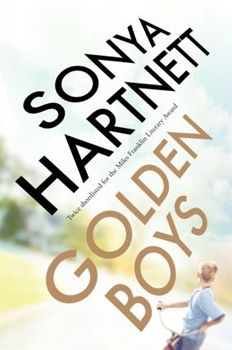 Utterly compelling and exquisitely written, Golden Boys is a dazzling new novel by Sonya Hartnett, one of Australia's sharpest and edgiest writers of contemporary fiction. An award-winning novelist at the top of her game, Hartnett has delivered, with graceful artistry, an unflinching, disquieting and astutely observed exposé of the darkness that can lurk in the seeming safety of suburbia. Sonya Hartnett's work has been published around the world. She is the internationally acclaimed author of several novels read by young adults and adults alike including Thursday's Child, Of a Boy and Butterfly. Her work has won numerous Australian and international literary prizes and her accolades include the Commonwealth Writers' Prize (Of a Boy), The Age Book of the Year (Of a Boy), the Victorian Premier's Literary Award (Surrender), shortlisted for the Miles Franklin Award (for both Of a Boy and Butterfly) and the CILP Carnegie Medal (The Midnight Zoo). Hartnett is also the first Australian recipient of the Astrid Lindgren Memorial Award (2008).